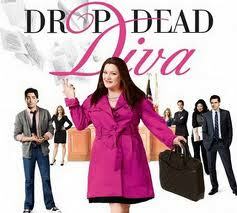 June 03, 2012 – Drop Dead Diva, Welcome Back: I spent my weekend watching ALL of season 2 of Drop Dead Diva on Netflix, partially to refresh my memory, but mostly because I missed half of the season. The latter is very important, actually. I did not know, until late last night, about the whole Stacy/Grayson misunderstanding that sent Jane running off to Italy with beau Owen; who gave up a chance to sail the something cup, and see real life hobbits, in New Zealand. This episode picked up with Jane and Owen in Italy, where they’ve been for 3 weeks. Jane is starting to feel homesick, and Owen is relieved because he’s over that whole luxury vacation to Italy thing. What was important to him with being with Jane. Awww. Back in America, the Ice Queen (aka Kim) is in charge. Noting the change in Grayson, over the last few weeks, she confronts him about it, but all Grayson wants to know is why his paycheck bounced. Ouch, seriously? Kim said that it was a computer glitch and brushed off his concern. Meanwhile, back in Italy, Terri appears out of nowhere to drag Jane back home. Turns out, she could have tracked down Jane at any time because she had a tracking device installed on her phone. Nice! Turns out, Ice Queen isn’t doing so great at running the firm in Parker’s absence, and the firm’s only hope is for Jane to come back and agree to be 1st chair on a murder trial! Whatever will she do? Well, of course, Jane has no choice but to go back! Especially considering that Ice Queen is willing to give her the key to the executive bathroom. Who could resist that? At the end of last season, after Grayson kissed Stacy in a futile attempt to reconnect with the true love of his life, she explained to him that she was not Deb; but Jane is. Apparently Grayson was too stunned and/or confused by this revelation at the time to ask Stacy to elaborate, so instead he waited three weeks and went to question Stacy, who had not been returning any of his calls. Stacy plays it off by stating that Deb was her best friend, and now Jane is. That’s all! Grayson doesn’t buy it, and later we see him putting 2 and 2 together; Deb died on the same day that Jane flatlined after being shot. Eureka! Now, most people would call that a coincidence, but it wouldn’t be nearly as interesting. Besties, Deb and Stacy run into one another at the elevator. Deb lets Stacy know that she saw her and Grayson kissing and how betrayed she felt. Deb then gets into the elevator and strikes a delicious diva pose as the doors closes on a flabbergasted Stacy. At home, Deb finds Stacy baking her favorite peanut butter M & M cookies and tells her that it was going to take more than cookies to forgive her. After all, it’s not like she simply spilled a bottle of nail polish on her new comforter! She kissed the love of her life! Stacy, finally finding her words, explains to Deb that she did not kiss Grayson; he kissed her, but he only kissed her because he was missing Deb so much. She stopped short of confessing to Deb that she told him that Jane was Deb. Deb forgives Stacy and all is well in Bestfriendville. With that out of the way, Stacy asks Deb if she knows where Fred is, since it is obvious that he didn’t go with her to Italy. Deb confesses that, not only does she not know where Fred is, she told him about the kiss she witnessed. Like magic, Fred shows up at the door, and he’s not alone. He has found himself a new love interest; Allison. Stacy is crestfallen and obviously desperate because the next thing we know she’s at some juice shop asking Kim Kardashian for love advice. Kim tells her to put all of her cards on the table and just be upfront with Fred about how she feels. She meets with Fred to put the cards on the table, but Fred is still smarting from her affair with the TV star, and is afraid of being hurt again. Besides, what about Allison? Stacy returns to Kim Kardashian to complain about her bad advice. Kim tells her that she should move and goes on to give her actual crappy advice about not taking him back – even if he came begging. Which he did, of course, after being dumped by Allison for hesitating after being asked if he was still in love with Stacy. Feeling as if there is no hope of reconciliation, Fred tells Stacy who he really is, and since he made that revelation, he will now have to return to heaven. Stacy thinks that this is the bestest love story she has ever heard, and changes her mind about being with him. It’s too late, however, because the rules have been broken, and apparently, since this isn’t Charmed and Stacy and Fred are no Leo and Piper, the rules cannot be broken for them. Stacy will have no memory of him. Case Summary: Jane’s client, Emily Horn, is an old college “friend” that is accused of killing her lover. Deb has no clue what Jane’s history is with her, but you can tell that, instinctively she never believed in Emily’s innocence. Jane, being Deb, said that she would do all that she could to defend her. Jane goes to interview Emily’s husband, who said he had no idea that his wife was having an affair until after her lover was killed. Which turns out to be important later on, because Emily informs Jane that he had known prior to the murder. The deeper they dug into the case, the more it looked like Emily’s husband was guilty of killing her lover and of framing his wife for it by way of a bloody wrench planted in her car. Once Emily got Jane to convince the court, and the DA, of her husband’s guilt, the charges against her are dropped and filed against her husband. In exchange for this, Emily agrees to testify against him. Although Emily agreed to testify, she later goes to Jane and begs her to help her husband, because… Wait for it: He isn’t guilty. Confessing that she actually killed her lover (because he threatened her husband), she states that she knows that Jane would never allow an innocent man to go to prison; besides she could prove that her husband was not guilty. The proof being that he was actually at a gym during the time of the murder. Since Jane herself could not defend the husband, she got Judge Owen to do it. Once in court, it becomes obvious to both Jane and Owen that Jane was being played from the start when they see Emily and her husband exchange a look once they realized that they were about to get away with murder. With double jeopardy applied, Emily admits that she was, indeed, the murderess and that her husband was innocent. Outside the courthouse, Jane confronts Emily and Emily smirks and notes how Jane has changed since college and walks off arm in arm with her hubby. Personally, I found it ridiculous that Jane was so easily played. I don’t know if it was because she had been away for a while or what. It was obvious halfway in that the woman was playing her, but Jane seemed oblivious to it. While still on the courthouse steps, Fred arrives to tell Jane that he is leaving because he has a job with Mad Men and that another guardian angel will be arriving to watch over her. Back at the office, Parker returns and finds Ice Queen putting her final touches on his redecorated office, which she had planned to move into during his absence. He introduces her to their new Angel investor, Luke Daniels, and Ice Queen promises to be out of the office by the end of the day. Luke goes to find Jane, and tells her that he is her new guardian angel. The final scene is of Daniel telling Stacy that he thinks Jane is Deb. This season should be interesting!